Welcome to Bannister Honda, the Okanagan’s #1 choice for new and used vehicle sales as well as auto parts, service, tires and detailing. We take great pride in exceeding our customers’ expectations and serving the fine people of the Okanagan Valley, including the Salmon Arm, Kamloops, Armstrong, Vernon, Kelowna, Penticton and Osoyoos areas. We also gladly welcome our customers from Princeton, Merritt, Lower Mainland, Vancouver Island and Alberta. We’ve been a part of your community since 2012, offering comprehensive vehicle servicing for all your transportation needs. Our Vernon, BC new and used Honda dealer would be delighted to speak with you, so we welcome you to contact us with any inquiries you might have. Or feel free to come see us at the “Swan Lake Auto Mile” off Highway 97, just North of Vernon. 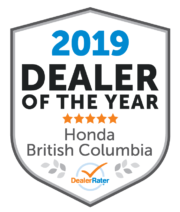 Experience the difference that has made us Canada’s #1 Honda dealer in BC, as chosen by DealerRater! We’d like you to be our customer regardless of whether or not you’ve purchased your vehicle with us, so our Service Centre doors are open to everyone throughout the Vernon, Penticton, Kelowna, Salmon Arm and Kamloops areas. Let’s get you booked in for that servicing you’ve been putting off for so long. Should you be looking for another brand of vehicle, then we can get you into one. We’ve got a broad selection of Toyota, Volkswagen, Subaru, Nissan, Mazda, Jeep, Kia, Hyundai, GMC, Ford, Dodge, Chevrolet and Acura models for sale to suit any taste. Take a look in our Used Vehicles Department to see what we have to offer with our Vernon, BC new and used Honda dealer. New Hondas are always topping the charts as the absolute best choices for consumers looking for quality, longevity and value. The Civic, Canada’s favourite sedan, is perhaps the finest example of this in Canada. But here at our Vernon, BC new Honda dealer, we’ve also got the latest models of the Honda CR-V and Accord, as well as the rest of the entire Honda lineup for Vernon, BC. Take a look at our New Vehicles Department to learn more about some of these top-scoring models. Our dealership is here to help you get a loan or lease for a vehicle regardless of what your credit is like. You’ll find with us a broad range of financing options with some of the most competitive rates in the BC area, and we’ll happily sit with you to discuss these options and rates and why they’ll work for your needs, specifically. You can easily get pre-approved for credit with us too. You’ll find a plethora of Honda tires and wheels with us here at Bannister Honda. We’ve got them for every season, at competitive prices and with a strong selection for all Honda models and other makes too. Our all-terrain truck and SUV tires are designed to offer optimum on- and off-road performance. Come check us out for an excellent selection of new Honda tires for the Vernon, BC area and beyond. When you order Honda car parts through Bannister Honda, you can be sure they’re as genuine as the ones that went into your Honda in the first place. We stock genuine OEM parts straight from Honda Canada, which means they’re as genuine as genuine gets. These parts are made specifically for your vehicle, built to work in conjunction with every single other component in your Honda.